Trust The Leading Roofing Contractor throughout Fremont - Universal Roofing! When you need a quality roof for your home or business, there's only one name throughout Nebraska - Universal Roofing. Our team is fully licensed, insured, and experienced to install or maintain any sized roof. We set the highest expectations and standards for our contractors to ensure that your roofing project is in the best of hands. Our specialty is dealing with the details and processing of your insurance claims. During that process, we try to make sure that your interests are secure and well represented to the insurer. If your property is certified as storm-damaged, your insurer may pay for a roof replacement; other parts may also be covered, like siding and gutters. We're glad to stop by and inspect your roof. If in the opinion of our managers and crew chief, you have sufficient storm-related damage to open an insurance claim, we will clearly spell out the process. We can open the claim with you, then we will meet with the Insurer to document what we believe is the evidence they should consider towards storm certification. Why Choose Us For A Roofing Contractor In Fremont NE? When you need a new roof for your home or business, you need a contractor that you can trust. Someone that goes out of their way to get the best results on a project, period. That's where our team here at Universal Roofing comes into play! We take the time to carefully analyze your location to help ensure that you're receiving the best materials and work possible! 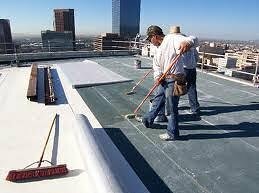 A Commercial Roofing Contractor in Fremont That You Can Trust! Our commercial division provides efficient and quality installation of all commercial roofing systems on new roofs; re-roof applications and repair or replacement solutions. Whether you're in need of small repairs or the complete construction of a new roof, we can design a system specific to your unique needs that can be both cost effective and energy efficient. Please call us today to discuss your building's commercial roofing needs. We're experienced roofing specialists, providing the highest quality roofs with exceptional customer service and we are here to help you! "I would like to let you know that my husband and I are very pleased with the work you did for us. Our roof was hail damaged and the insurance covered a new roof and it looked very nice and your employees were so professional we decided to have you do our windows as well. I can't believe how nice my new bay window in the family room looks. The work was done on time and your installer made sure we were happy with everything when he completed the work. Thanks again for the great work." If you're looking for the best roofing contractor in Fremont, then we'd love to hear from you! Our team of contractors is standing by to let you know how our roofing services can help your home or business with a brand new or repaired roof! We offer FREE estimates and proudly serve the greater Omaha area.